Multiculturalism is the embodiment of many cultures or the love of two or more cultures. In the news recently, it was the reason cited by, Breivik, the Norweigan terror suspect who felt that his country’s culture was threatened by Muslims. According to news reports, Breikik held contempt for cultures that weakened his country. Hence, individuals who do not integrate or assimilate into the “new” country run the risk of arousing misunderstanding that leads to unintended hatred. In the U.S., immigrants bring their native born cultural DNA and adopt the American way of life. They learn to blend the two and hold on to their conservative values that most often comes from their religious affiliations. The children of these immigrants, and their offspring fully assimilate and prefer the Conservative American values and way of life as their new identity and choice of loyalty. 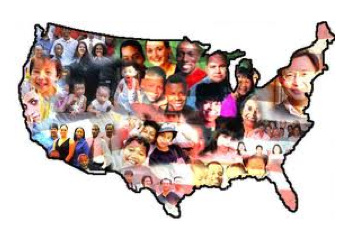 Our country has attracted waves of immigrants who come from various cultures worldwide. Each has contributed to the creation of our nation in her strength and vitality. This pluralism of cultures has given us an enriched language, art, foods, music, and technological advantage to become a Superpower in one of the shortest periods of recorded time. Studies also show that these immigrants hold the strongest Conservative values equal to that of the Republican Party. As it was true in the 1700s, people from all over the world continue to come to America seeking freedom from oppressive governments while also looking for economic prosperity. Their work ethic speaks for their drive to better themselves and their family, gladly working in some of the most dangerous and physically demanding menial jobs. Many immigrants risk everything including their family, material possessions, and oftentimes their lives to come to America. They love their culture but they love the country that embraces them and affords them a better way of life beyond abject poverty. The Love for this country is magnified as the generations reach a level of a middle class that was not available to them in their country. While many independents are born in the U.S., those with high concentration of conservative values are immigrants who have naturalized into the U.S.
Our founding fathers were men of a great vision who formed America as a predominantly white European protestant nation, but the ideology on which it was built was consistent: freedom from tyranny and a free market. These beliefs would eventually become coined as American values that allow anyone with a great work ethic to reach the American dream and rise from rags to riches. In the next part of this series you will read about how a founding father, born in the West Indies, eloquently described his naturalized citizenship. So what does love have to do with it? Plenty. Those who forget to honor this nation also forget that the Love for this country is the essence of our democracy. 10. Be proud of being an American--and, like Linda says, that means loving your country!